The participation of Bangladeshi companies in a four-day trade show in Guangdong has made easier for Bangladeshi products, especially leather and jute goods, to explore market in China, observed experts. The expo titled ‘2018 Guangdong 21st Century Maritime Silk Road International Expo’ was held at Guangdong Modern International Exhibition Center in Houjie of the Dongguan city from Oct 25 to 28. Besides, the Export Promotion Bureau (EPB) of Bangladesh has planned to take more initiatives to encourage the country’s entrepreneurs to participate in more exhibitions in China and other countries for popularizing their products in the region. Talking to BSS, EPB Director General Avijit Chowdhury said EPB is providing all sorts of facilities to the entrepreneurs to ensure smooth participation in fairs and strengthen the position of Bangladeshi products in the Chinese market. “We want to brand Bangladesh before the world. So, we try to send quality products to any expo. The demand of our products in the world market lies beyond any question,” he added. Deputy Managing Director of the Small and Medium Enterprise Foundation SM Shaheen Anwar said the expo in Guangdong was a good opportunity for Bangladeshi entrepreneurs to explore markets for their products in the China as the first two-day of the fair was for sourcing and the rest of the days for consumers. “The quality of Bangladeshi products, including leather and jute goods, is of international standard. The Bangladesh government should take more promotional activities for the Bangladeshi products in the Chinese media,” he added. Managing Director of the Karigar Engineer Suman Kundu said the Chinese people were very happy to purchase the Bangladeshi products, especially leather goods. “The response to our leather products was very good. But, language was the main problem. So, the Chinese people could not understand properly about the quality of our products,” he added. Director of the Golden Jute Product Enamul Kabir said the responses to the Bangladeshi products in the expo were huge. “Many people visited my stall every day. The sale at my stall was very well,” he added. This year, a total of 34 Bangladeshi companies, including eight small and medium-sized enterprises (SMEs), took part in the trade show. The Yunnan Bengal Business Information Consultation Company Limited was the consult for Bangladesh in the organizing committee. 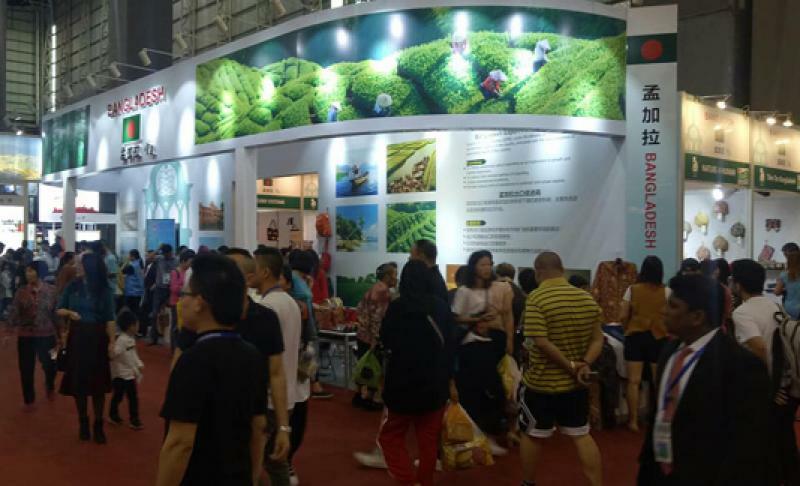 Marketing Executive of the Yunnan Bengal Business Information Consultation Company Istiaque Hossain said the response to the Bangladeshi products in the expo was very well and some companies have already got export orders for their products. A total of 1,732 exhibitors, including 1,221 overseas enterprises, and organizations from 57 countries and regions took part in the trade show.